This tasteful and eclectic cottage in Napa Valley, California looks like the perfect retreat for a creative artist. 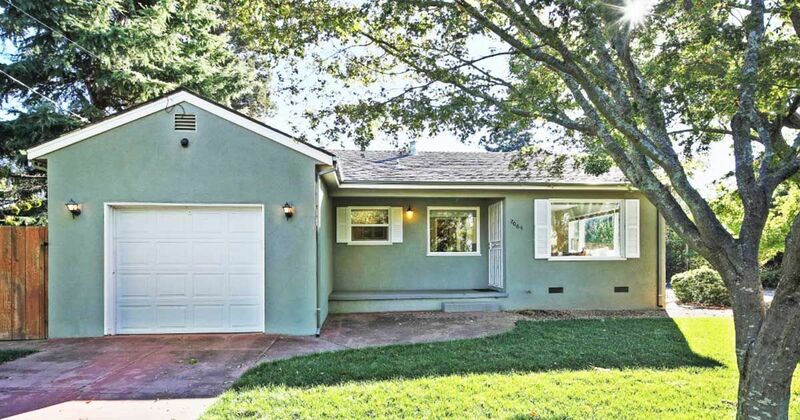 The home was built in 1952 and is only 846 square feet (78 square meters) with a layout that includes two bedrooms and two bathrooms. It's currently listed under contract with Sotheby's International Realty. The interior is flooded with natural light, making each room bright and cheerful. In the backyard you'll find a beautiful studio space - red and rustic on the outside, white and elegant on the inside. Take a look around in the full photo tour below. 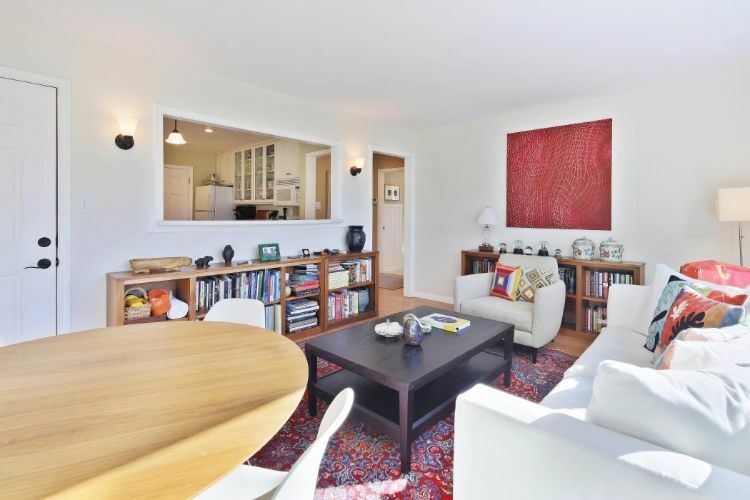 The home enters into an eclectic living room with mismatched but coordinating furniture, and red accents. A table and chairs function as a gathering spot or dining table. This view of the living room shows a window into the kitchen, as well as an entrance to the hallway. 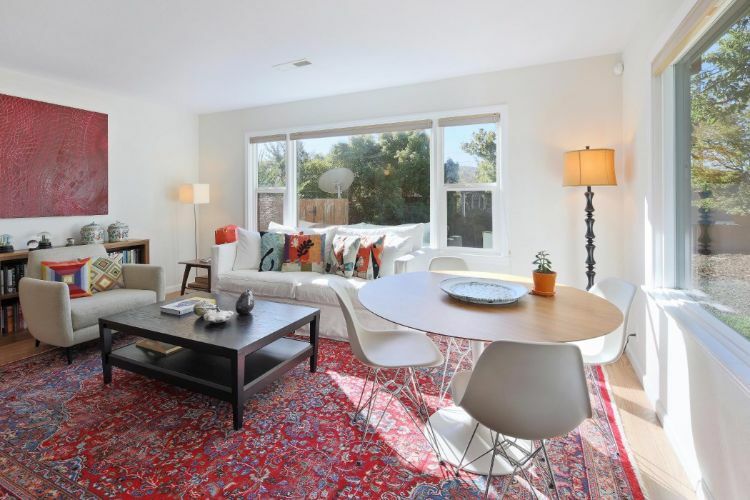 White walls make the room feel bigger, while a Persian rug anchors the space. 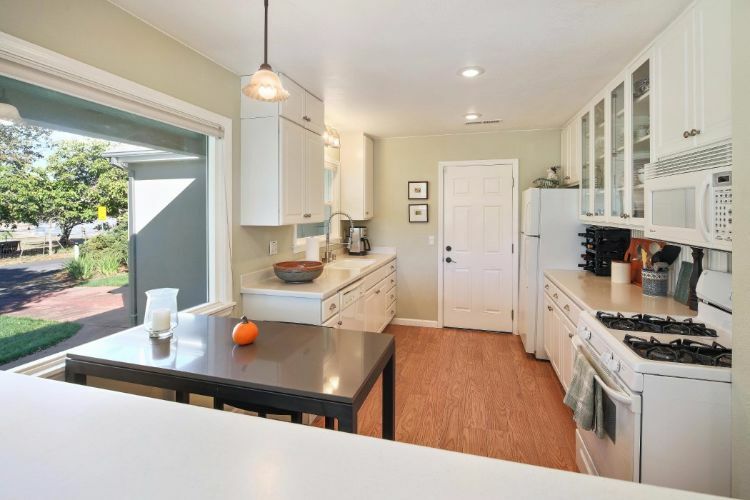 The galley style kitchen is small but efficient. White appliances blend seamlessly with the white cabinetry. An eat-in dining space can also double as a prep space while preparing meals. 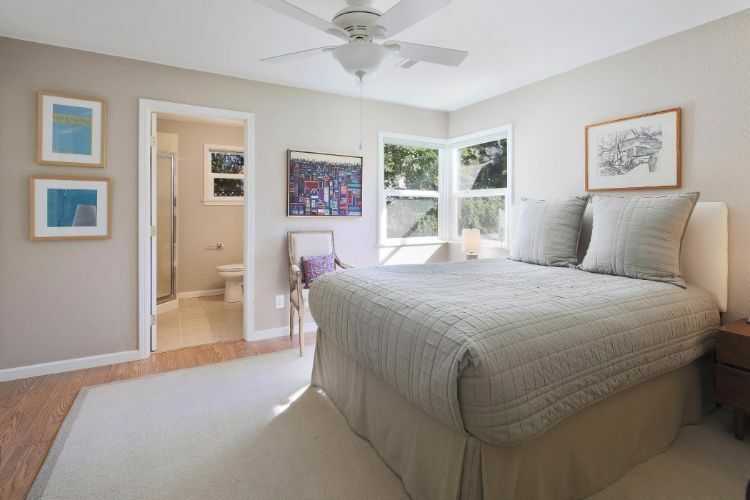 The neutral master bedroom is a relaxing space with an airy feel. Abstract artwork adds a bit of color and interest. 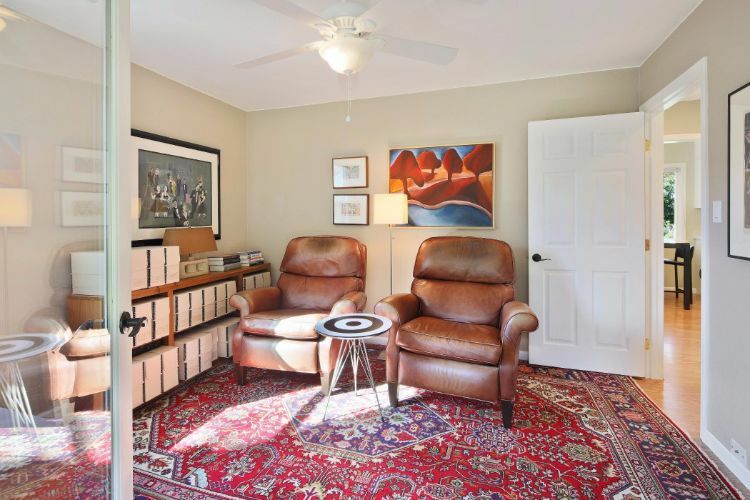 The second bedroom is set up as a sitting space with comfy chairs and another cushy Persian rug. A French door leads to the spacious backyard. 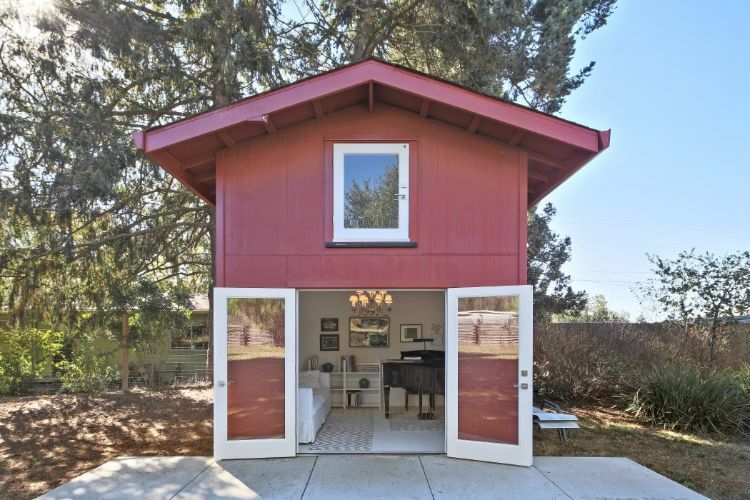 The outdoor studio space is in a charming red building, reminiscent of a barn. Glass French doors allow views of the large yard and the famous rolling hills of Napa Valley. On the inside, the studio is white and elegant with a large chandelier and plenty of tasteful artwork. 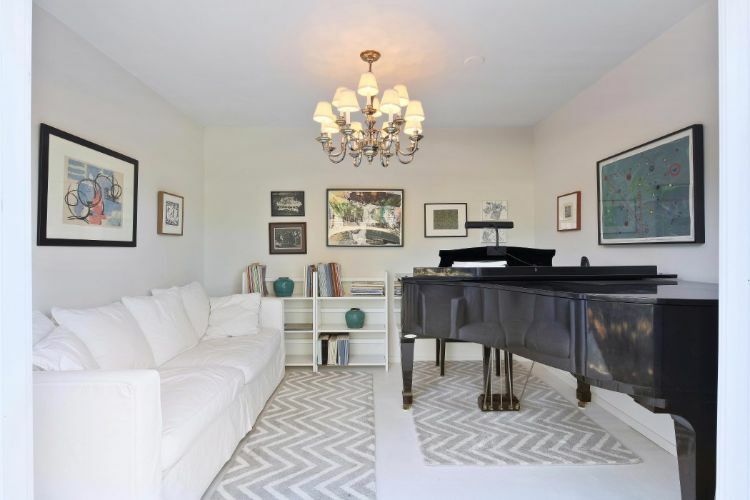 White furniture and neutral rugs allow the grand piano to be the focal point. If you're loving this California cottage full of creative spaces, be sure to share this photo tour for future inspiration. You can share it on Facebook, Instagram or Pinterest.